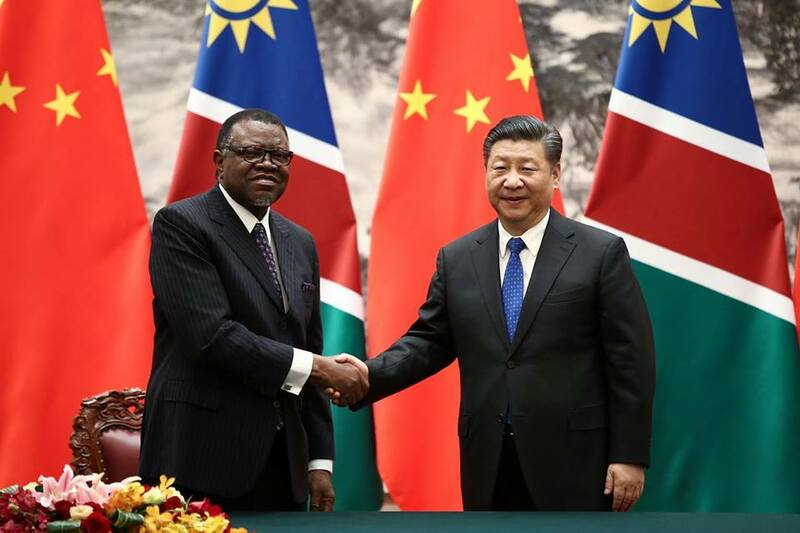 Pictured: Chinese President Xi Jinping (R) shakes hands with Namibia’s President Hage Geingob (L) in Beijing China last year. Photo: contributed. 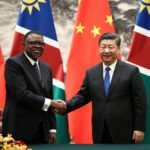 Since 2015, an array of over 20 China-Aided projects have been completed or are still going on in Namibia, which widely covers the areas of infrastructure, agriculture, education and, health care amongst others funded with a total of N$2.8 billion in grants or concessional loans provided by China. This was revealed by Yang Jun, Charge d’Affaires from the Embassy of China to Namibia whom was speaking at the Theo-Ben Gurirab Lecture series titled, The impact of China-Africa relations on Namibia in the context of the forum on China-Africa cooperation. Jun stated that according to statistics, Chinese Companies in Namibia have created 11 000 jobs so far, and have brought US$ 34 million Foreign Direct Investments (FDI) to Namibia and have generated N$250 million in tax revenue since 2016. He stated that the year 2018 recorded a robust growth of bilateral trade at a volume of US$800 million, up by 42.5%，among them, Namibia’s exports to China is about US$500 million, seeing a year-on-year increase of 68.2%. In the field of people-to-people exchange, in 2018 alone, more than 40 outstanding students from Namibia went to China for further studies funded by Chinese Government Scholarship. In addition, more than 300 elites from all walks of life of Namibia went to China to participate in training and research projects. More than 400 primary and middle school learners from all over Namibia received the Chinese Ambassador Scholarship and 10 000 children from poor families received Panda Packs (schoolbags with stationery and books) donated by ordinary Chinese people. Also speaking at the event, Annely Haiphene, Executive Director, National Planning Commission (NPC) stated that Namibia is classified as an Upper Middle Income Country (UMIC) and the net Official Development Assistance (ODA) began to decline as most donor countries either shifted their mode of cooperation or their support to other regions which are deemed to be in dire need. She further stated that bilateral programmes between China and Namibia are strategically aligned to the envelopes outlined in the Plan of Action informed by Namibian priorities. “ODA remains essential for the implementation of Vision 2030, the Sustainable Development Goals (SDGs) and other Internationally Agreed Goals (IAGs). Namibia has resorted to maintain cooperation with our DPs to promote partnerships and trade. China is one of Namibia’s big bilateral partners as informed by the ODA,” she said. Currently the country has eight major initiatives supported by China which is well integrated into the national development strategy. Haiphene said the Harambee Prosperity Plan, which aims to pull the efforts of all Namibians together in the same direction towards prosperity, has much in common with the Eight Major Initiatives in terms of their goals and ways to achieve them. Current projects which are set to benefit from FOCAC include Phase 2B of the Dordabis Interchange to Windhoek, Hosea Kutako International Airport road. (21.3km); Constructions of four rural schools and hostels; Space Tracking, Telemetry and Command Station\Satellite Data Receiving Ground Station; and Construction of Social Housing in Gobabis and Grootfontein.